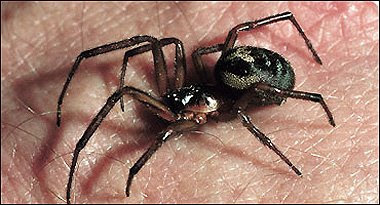 A VENOMOUS spider is spreading across Britain due to climate change, experts warned yesterday. The False Widow — cousin of the Black Widow — carries enough poison to kill a human. It first arrived in Devon from the Canary Islands 140 years ago. But it has now set up colonies in Gloucestershire and Wiltshire after a series of mild winters. Gran Lyn Mitchell, 52, fell into a coma after being bitten as she slept at home in Egremont, Cumbria, in January. Joanne West, 32, was temporarily paralysed by a False Widow on her bed three months later in Fareham, Hants. 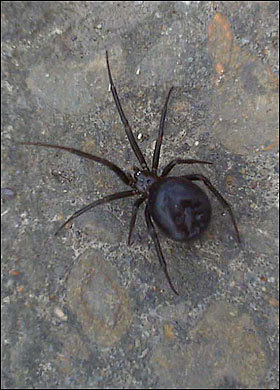 The purple and black creature looks similar to a Black Widow, but has a smaller body — the size of a 1p piece.